This post is sponsored by Side Delights® through Kitchen PLAY. All opinions are my own. 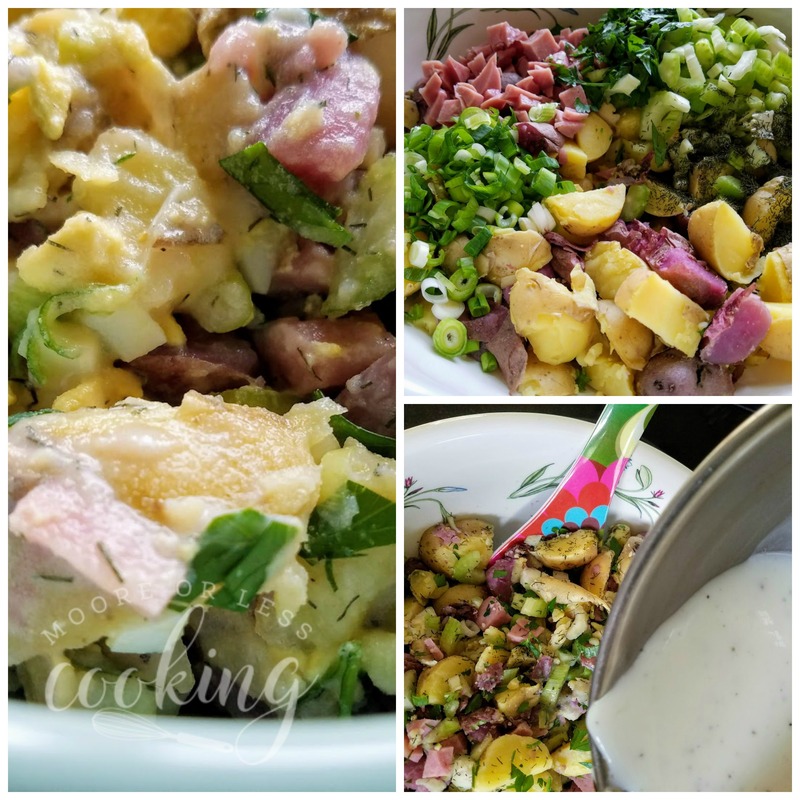 This Country Potato Salad is creamy and colorful with all the different flavors coming through in every bite! Summer is filled with lots of BBQs and delicious side dishes for potlucks and dinners. The most popular side dish is potato salad at our BBQs and holiday potlucks. 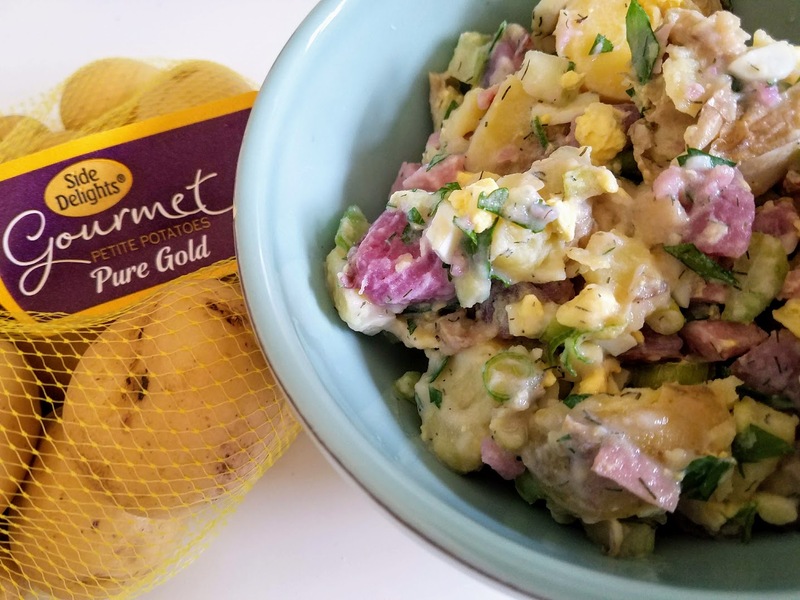 This potato salad is so delicious with creamy Side Delights® Gourmet Petite Pure Gold and Fusion Fingerlings potatoes, chunks of smoked ham, crunchy celery, chopped hard boiled eggs, and fresh herbs. No mayo needed! It’s a crowd pleaser for sure! You can make this Country Potato Salad in a short amount of cooking time. I think it tastes better the next day with all of the flavors melding together, that is if it lasts by that long! 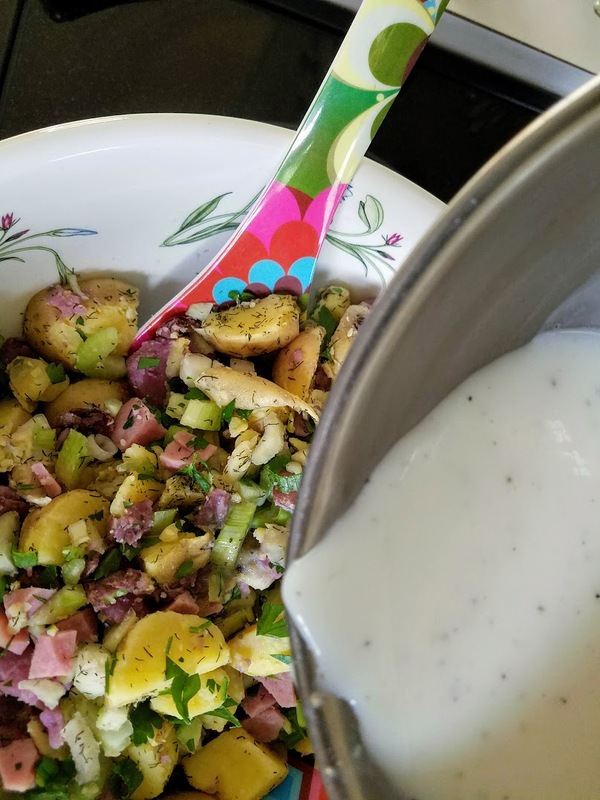 If you aren’t a fan of mayo you will love this potato salad – it’s like a meal in itself! 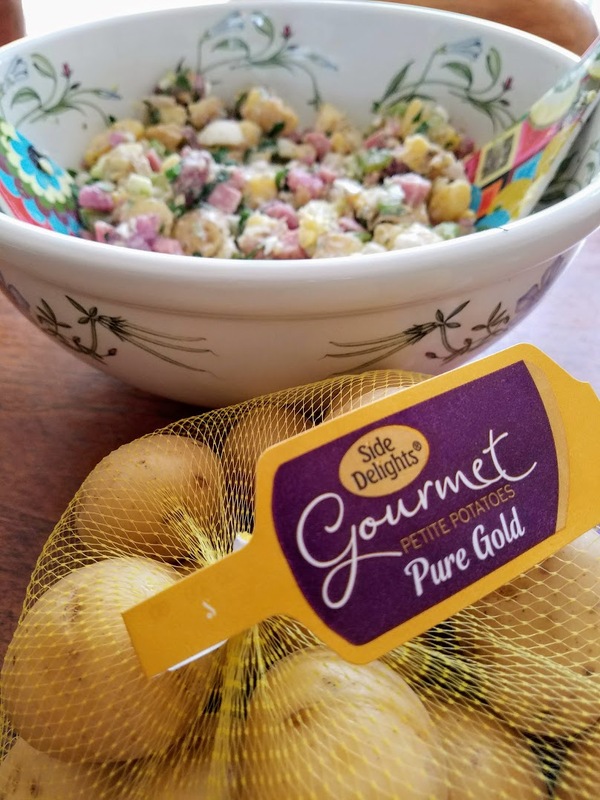 I am a fan of Side Delights® brand of fresh potatoes because they are healthy and delicious fresh potatoes, the ultimate comfort food! They continually strive to delight their readers with new, innovative products to fit every meal as well as delicious recipe suggestions. 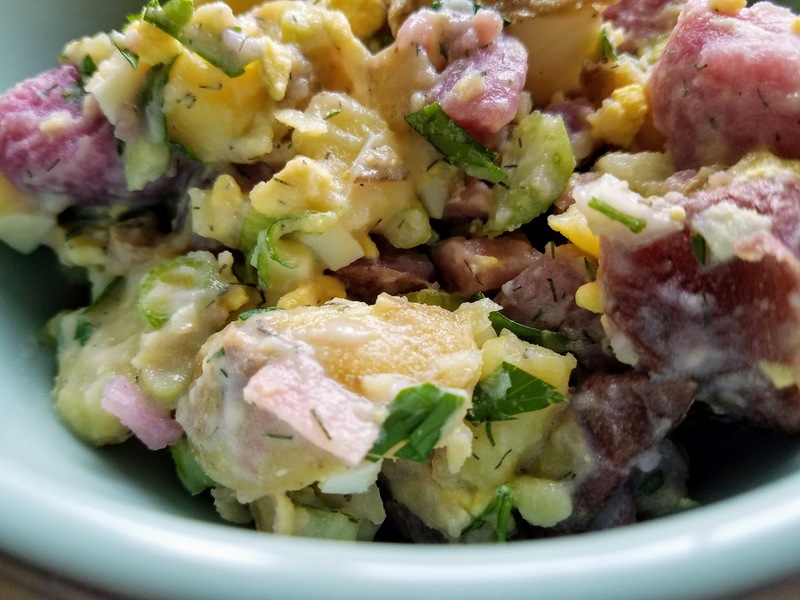 Country Potato Salad is the perfect side dish: as its simple ingredients mean you may have everything in your fridge to make this easy recipe. I included the purple and small potatoes for this recipe to give it a festive and beautiful color. Not only does it look beautiful, but it tastes amazing! Pour dressing over Country Potato Salad ingredients. Gently toss. Add chopped hard-boiled eggs at the end and gently fold in. Creamy and flavorful! Don’t forget to enter this wonderful giveaway!! Prize: A sample box of Fresh Side Delights Potatoes and an Instant Pot! Place potatoes in a large saucepan, cover with water and bring to a simmer over medium-high heat. Reduce heat to medium and cook, partially covered, until just tender, 12 to 20 minutes, depending on their size. Drain and let cool for about 15 minutes. When the potatoes are cool enough to handle, taste a bit of potato skin—if it’s bitter or tough, peel the potatoes, otherwise, leave the skins on. 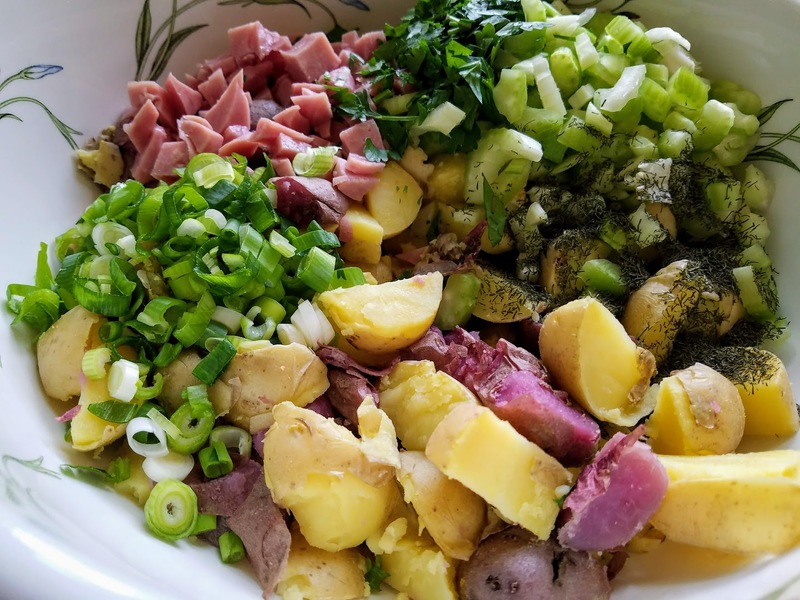 Cut the potatoes into bite-size pieces and put them in a large salad bowl. Add celery, ham, parsley, chives (or scallions) and mint (or dill) to the potatoes. Add buttermilk, lemon juice, oil, salt, and pepper; stir to combine. Gently stir in chopped egg. TIP: To hard-boil eggs: Place eggs in a single layer in a saucepan; cover with water. Reduce heat to low and cook at the barest simmer for 10 minutes. Remove from heat, pour out hot water and cover the eggs with cold water. Let stand until cool enough to handle before peeling. Ooh yum! This looks like a great potato salad to try! Oh Nettie that looks so yummy! 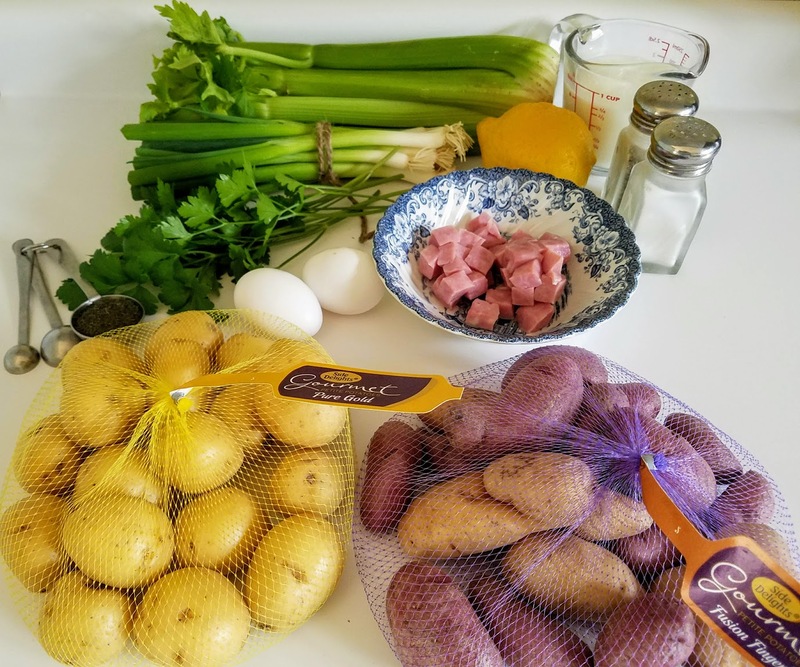 I’ve been on a mission to find a great potato salad recipe! Definitely trying this one out! Love the unique ingredients in this potato salad! Thank you Kristy! The ingredients work well with this recipe. Oh I just love that you used buttermilk in this! And the ham is great with the eggs for extra protein. Great recipe! A staple for your summer bbq. It looks delicious!!! 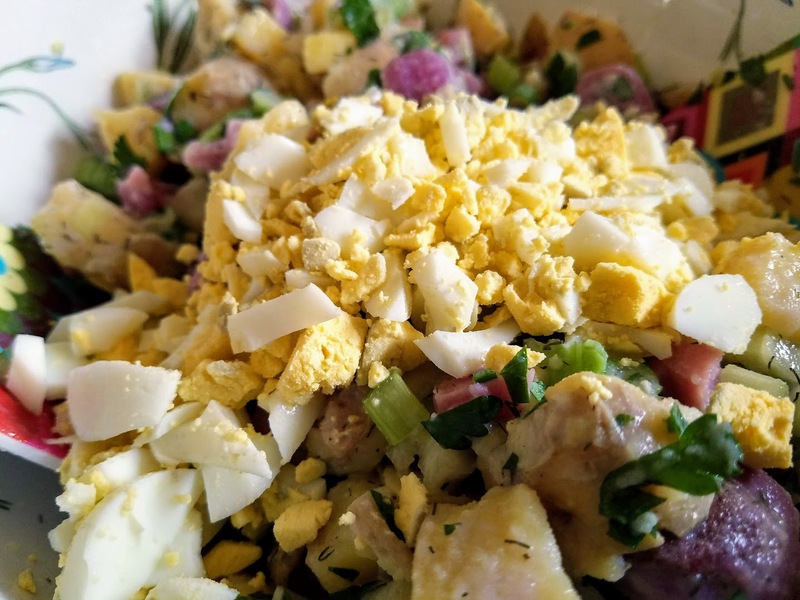 Your Country Potato Salad looks amazing! Hope you are having a great week and thanks so much for sharing with us at Full Plate Thursday.